Currently, only a 6128 PLUS can launch the game. A 464 PLUS (or a patched GX4000) should be able to run it if the memory extension meets the priority of the ASIC bank at #4000. The ASIC bank must have the highest priority, especially when using #C2 mode. This is excellent stuff. Now you get me truly interested in the CPC+ power . Thank you for your contributions !! Especially, for Starkos and Arkos Tracker. It was something on Youtube! The C64 remake was a masterpiece and now on Amstrad 6128+, now with the magician and frog, wow like a low-res arcade version. and one of the best arcade ever, we are damn lucky! Is it a disk load of a cartridge? I take the opportunity to greet and thank gerald for his fantastic card C4CPC without which nothing would be possible. Ouch that failed badly... how come? There are far better than this. Cursed Castilla, a spanish freeware game on Windows/Mac/Linux got physical release of an enhanced edition on ps4/vita (vita still available on play-asia + Steam) and it's a masterpiece. Another work in progress multi-plateform game is Battle Princess Enjoy. Ghost'n'Goblins and Ghouls'n'Ghosts are still quite popular in fact. Well, taking into account the vast maps, the quality of the assets, the time needed to complete it, machines, licenses, etc... it's not a crazy amount of money. Judging that they only raised $3097, they really did a bad job promoting the game, which is vital these days. It's a pity nonetheless, as the game looks awesome. I hope they can find a way to make it happen, maybe Steam Greenlight. 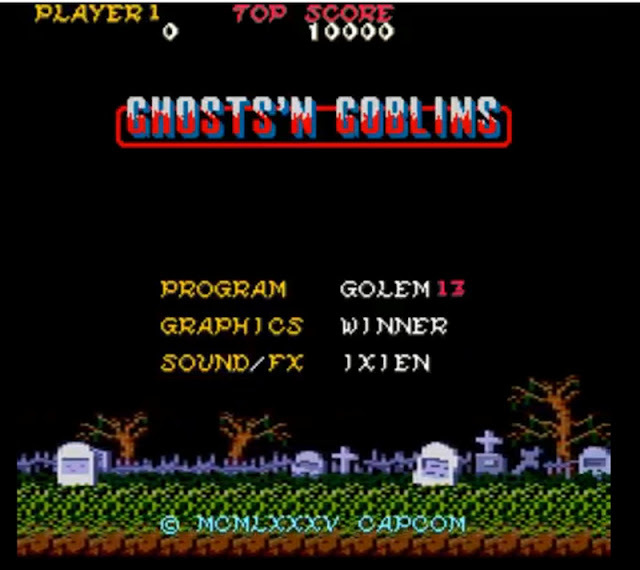 It's not, but given that Ghosts N' Goblin's is one of Capcom's biggest cash cows. They weren't going to give the licence to use it away for buttons either. The latest game in which I worked did cost several millions of euros to develop, so as soon you have more than 3-4 people on the team, the cost raises like hell. It's peanuts when you start talking about people having to actually earn a salary from doing the work rather than doing it as a hobby. Even without licensing rights, there is a lot of upfront risk that you need to mitigate in case sales don't pan out too. There's a reason most development is backed by big, wealthy publishing houses. Is it an official licence? I didn't notice that when looking at the kickstarter. It made reference to GnG I saw that. Doesn't matter. If they ran with a conversion without permission, it would land the entire team in deep doo doo. We're talking about a company who requested that TACGR remove images of Donkey Kong, etc. Registered trade marks and copyright, etc. Are you talking about Capcom, or Nintendo? Since that sounds like a very Nintendo thing to do (and Donkey Kong is Nintendo's property). You're right. I got my wires crossed there. If everything goes as planned, the game should be released next year. To give you all news about this project, the game will not be ready for this year but it is still in development and is better now than the last video of the November 17 can show. The first level is the only one that is fully playable with all arcade details, but the others are being integrated. The game engine is now fully coded and powerful. The main work now is to develop and integrate all the enemies still missing, with a behavior as close as possible to the arcade. It is also necessary to adjust the level of difficulty (easy, normal, difficult, very difficult) with intermediate evolutions of it during the game (like the original). Graphics, music and sfx are not final yet and need to be changed and adjusted on many points. Overall, the project is progressing well, although slowly. If you have any questions about this project, do not hesitate, I will try to answer at best. I will do, soon I hope, a new video, without revealing too much .... But there will be no public release for now. Page created in 0.438 seconds with 104 queries.